The county of Shropshire lies right on the border between Wales and England. It is a county consisting of patchwork fields, rolling hills, rivers and beautiful wooded valleys. There are plenty of attractions in the county from the Severn Valley Railway through to Medieval Castles and ancient Roman remains. 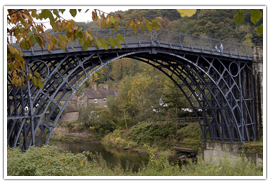 This is the county that can claim Charles Darwin as one of their own; it is also home to Ironbridge the town with the magnificent Iron bridge which spans the Severn Valley. There are a number of events which take place in the county every year including music festivals, agricultural shows, and historical re-enactments. Travel time to London is approximately three and a half hours by car and around two and a half by train. There is no direct rail link from London to Shropshire and travelers are required to change trains part way through the journey. 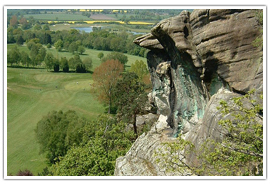 There are a number of towns in Shropshire which are well worth visiting, either for their ancient connections of the modern attractions. The most important town in the county. It is nestled within a large loop of the beautiful River Severn and filled with half-timbered medieval houses, a castle, an abbey and just about anything else you could wish for in an ancient English town. While the town was established by the Saxons it was the Tudors who really developed the town. It is home to almost 700 listed historical buildings. There are a number of walking tours which will allow visitors to take in all of the major historical sites including the abbey and the castle. This is the birthplace of Charles Darwin and there is a statue of the man located outside the library building. The town was the location for the first production of cast iron and is, therefore, home to the first bridge constructed of cast iron in the country. It was designed in 1778 by Abraham Darby and still stands strong today as a monument to the countries industrial heritage. Considered as the birthplace of the entire industrial revolution it is now a UNESCO World Heritage Site. 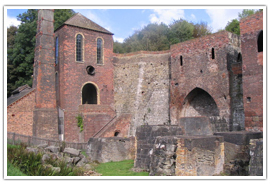 There are a total of ten museums dedicated to the Ironbridge Gorge which highlight different aspects of the bridge and the history that surrounds it. The town is also home to an Old Court House and a Victorian Police Station. 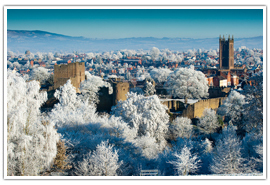 Food is very much at the heart of life in Ludlow, it is widely regarded as being the gastronomic capital of the county. The town is filled with specialty food outlets and plenty of restaurants. 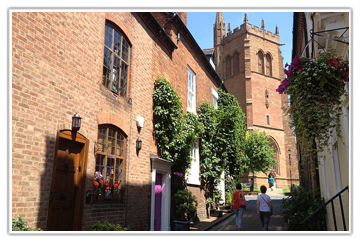 It is a pretty town filled with half-timbered buildings and of course Ludlow Castle which still dominates the town. There are a number of food festivals which take place in the town every year. There are some wonderful outdoor spaces to enjoy around this beautiful county. Located in Willowbridge, Market Drayton the gardens offer spectacular views over the beautiful Shropshire countryside. It offers a tranquil and intimate experience to visitors as the pathways wind their way through both formal and informal gardens. Waterfalls and a woodland garden along with some unique plants await people here. Throughout the summer the gardens are open daily from 10.00am – 5.30pm, with opening hours varying across the rest of the year. 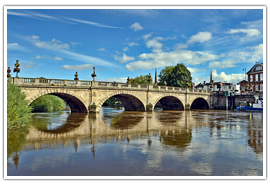 Located in Shrewsbury the park was created during the 18th century. The park is centered around the Grotto Hill and the Red Castle there are around 100 acres to explore filled with delightful pathways which lead the visitor through archways, across bridges and around the decorative follies which are placed around the park. Opening times vary with the season through the main opening times are 10.00am – 5.00pm. Located in Quatt near Bridgenorth this is a traditional working estate set around a mansion house. 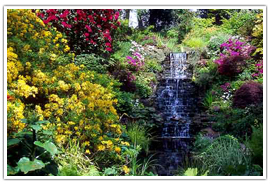 The gardens span nine acres and contain an American garden and a striking rockery. Wooded glens, the Dingle, and the Big Pool are all popular with visitors. Opening times vary with the season through the gardens are open between March – October, Sunday through Thursday between 12.00pm – 5.30pm. Located in the very heart of Ludlow the castle dates back to the late 11th century and was built as a border stronghold. It later became a royal palace. As the castle has been expanded and built on over the centuries there are plenty of examples of both Norman and Medieval, as well as Tudor architecture. 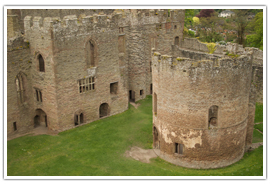 Opening times for the castle vary, so for more details on when you can visit as well as prices and events, visit http://www.ludlowcastle.com. Setting for the medieval murder mysteries of Cadfael, Shrewsbury Abbey is a popular destination for visitors to the county. The abbey which stands on the site today was built after the Norman Conquest and replaced a wooden church and monastery which was originally on the site. The abbey is believed to house the mortal remains of St Winefride who dies during the 7th century. 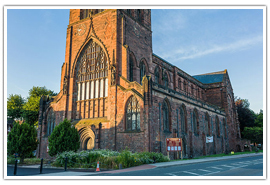 For more information about opening times and events please visit http://www.shrewsburyabbey.com. Located in Madeley, Telford, Blists Hill Victorian Town is one of the ten museums dedicated to the history of Ironbridge. Throughout the town, daily life is carried out just as it was during the reign of Queen Victoria. Visitors can make purchases in the period shops and take part in numerous events which take place across the year. Open throughout the year from 10.00am – 5.00pm during summer and 10.00am – 4.00pm during winter. Visit their website to learn more about scheduled events. There is much more to take advantage of here than simply the history of the county. 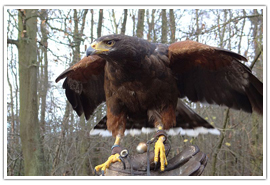 Hawks on Walks is based at the Battlefield Falconry Centre in Shrewsbury. They offer a unique opportunity to be a falconer, handling some impressive birds of prey. Walks with the birds last for an hour during which time they will be released and allowed to return to you several times. For more information about prices and booking visit their website and check out their offers. 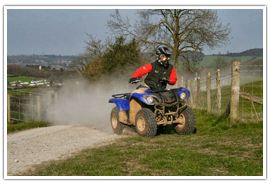 Border Quad trekking is based just outside of Shrewsbury and offers visitors the opportunity to experience the thrills of quad trekking as well as many other outdoor pursuits such as archery and paintballing. For more information on activity, packages check out their website. 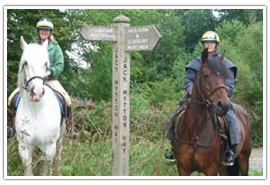 Country Treks Equestrian Centre is located in Stottesdon and offers a unique way to explore the Shropshire countryside. No experience is necessary as instruction is provided. For further information about available packages visit their website. Treat yourself to a delicious afternoon tea in one of the many hotels and tea rooms in the county. Located in Ludlow, Fishmore Hall offers a traditional afternoon tea complete with dainty sandwiches and delicious pastries and cakes. 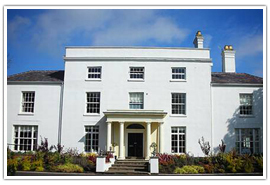 Enjoy your tea on the terrace of this wonderful country house or in the orangery or lounge. Afternoon tea is served between 3.00pm – 5.00pm daily and costs around £17.50. Visit the Fishmore Hall website for more information. Set within a beautiful timber-framed building which dates from the 17th century the tea rooms offer a number of choices for afternoon tea. 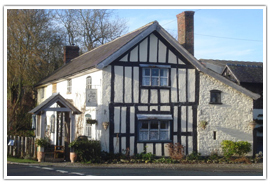 Based in Clungunford, menu information and prices can be found at http://www.rockecottagetearooms.co.uk. 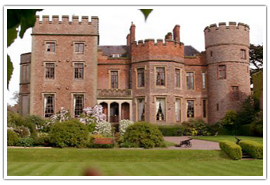 Located in Shrewsbury this hotel offers the setting of a fairytale castle for your big day. It is a 17th-century building which is Grade II listed. 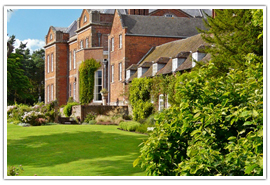 The hotel is surrounded by beautiful grounds and gardens with hidden pools and woodlands walks. 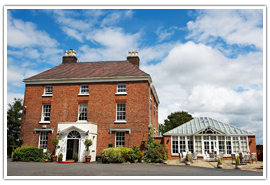 Located in Shifnal the hotel offers the perfect venue for a country wedding. The grounds and gardens offer the perfect backdrop for some incredible wedding photographs, while the county house hotel offers plenty of facilities for the wedding party and their guests. Located in Norton, this is a unique wedding venue is a 17th-century barn complete with ancient oak beams. The venue offers an intimacy which can often be lacking in other venues and makes for a memorable experience for both you and your guests. With more than 140 campsites and caravan park to chose from there are plenty of places to pitch your tent within the county. 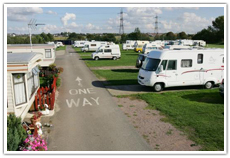 • Much Wenlock Caravan Club Site – Stretton Road, Much Wenlock, Shropshire. 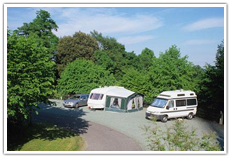 • Oswestry Camping and Caravanning Club Site – Cranberry Moss, Kinnerly, Oswestry, Shropshire. • Southview Certificated Site – Wall Under Heywood, Church Stretton, Shropshire. • Ty Mawr Certificated Site – Lyneal, Ellesmere, Shropshire. • By the Wood Certificated Site – Newhouse Lane, Church Pulverbatch, Shrewsbury, Shropshire. • Abdo Hill Farm Certificated Site – Rosehill, Market Drayton, Shropshire. • Westbrook Farm Park – Little Hereford, Ludlow, Shropshire. 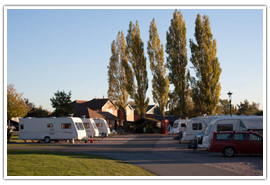 • Royal Hill Caravan Park and Campsite – Edgerly, Oswestry, Shropshire. 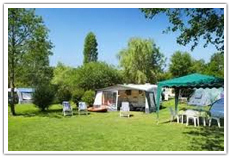 • Walcot Hall Caravan Park – The Powis Arms, Lydbury North, Shropshire. • Old School Caravan Park – Shelve, Minsterly, Shropshire.